The Very Best Of Dolly Parton Vol. 1, the SonyBMG compilation disc from last year, remains steady this week on the British albums charts, staying at No. 1 country and No. 23 pop in its second week this year. Meanwhile, Dolly's Backwoods Barbie falls another nine spots to No. 61 pop and hangs on at No. 4 country in its third week on the U.K. tally. A few notes from around the continent come in this weekend on Dolly's Imagination Library literacy program. Newfoundland, Canada's The Independent News covers its work in Stephenville here, The Columbia Missourian talks about the efforts in Columbia here and near Pensacola, Fla., the program's Century chapter got some ink here. Thanks to viewer votes, Dolly's video for "Jesus & Gravity" regains the top spot this week on the Pure 12 Pack Countdown on CMT's Pure Country digital cable channel, it was announced Friday. The song moves up one in its ninth week on the chart. Vote for it in the regular CMT countdown here and 12 Pack here. As was noted here as a likelihood when the British press on Thursday began saying Dolly was to play England's Glastonbury Festival on Sunday, a Dolly spokesperson released a statement to the media on Friday confirming that Dolly will, in fact, be absent from the festival due to her second sold out Glasgow concert the same night. Read notes about that development from NME here and The Sun here. Speaking of which, a review of her first sold out engagement in the city was posted Friday from The Scotsman here, while This Is Nottingham previews her show there with an interview here, The Daily Mail plugs several concerts with a preview here and The Birmingham Mail does the same here. And The Tour Collection four-CD boxed set gets a positive review, four out of five stars, from London's The Times here. If something doesn't happen soon, Dolly's Backwoods Barbie could be gone from the country albums charts in the U.S. in a matter of weeks. The album tumbles another nine spots this week in the July 5 numbers released Thursday to come in at No. 58 on the 75-position tally, placing it in the bottom third of Billboard's chart in its 18th week. The greatest hits collection 16 Biggest Hits, though, remains steady at No. 45 country in its 37th week. Emmylou Harris holds on for a second week at No. 4 country but slides eight to No. 30 pop with All I Intended To Be, a CD that includes Dolly on the track "Gold." That album also remains steady at No. 2 in Canada but drops 21 points there to No. 45 pop. Brad Paisley's Time Well Wasted, featuring Dolly on "When I Get Where I'm Going," rises three to No. 12 on the country catalog albums list, while the collection God Bless the USA, with Dolly's "Color Me America," loses 19 to No. 63 country in its eighth week. The self-titled debut CD from Taylor Swift remains steady at No. 1 country and drops three to No. 19 pop in its 87th week, and Toby Keith's 35 Biggest Hits also remains steady at No. 2 country and falls eight to No. 26 pop in its seventh chart week. Britain's The Sun reported here Thursday that Dolly is the "BIG" surprise guest for this year's Glastonbury Festival in Pilton, England, scheduled for a Sunday performance to close out the event. However, I'm not sure the news is correct, as she has a sold out concert the same night more than 300 miles away in Glasgow, Scotland. Meanwhile, she's in Glasgow for Friday's first sold out engagement in the city before heading to Manchester on Saturday. I'm told she changed things up a bit in her second night in Belfast this week, changing out a few songs that had not been performed the previous night, including "Drives Me Crazy" and her piano version of "The Grass Is Blue." She also told a few different stories from her life and career than she did in the first show as well. Thanks, Graeme! Kilkenny People on Thursday posted news on Thursday from her recent concert in the Irish city here and here. And thanks to Mark for passing along another shot of Sweden's Princess Madeline's enjoying Dolly's Stockholm show earlier in the tour here. Dolly continues to charm audiences this week on the European leg of her Backwoods Barbie World Tour. She talked with The Belfast Telegraph in Sunday's paper, which posted an electronic version of the interview online Wednesday here. The newspaper also on Wednesday gave her high praise for her concerts in the city, calling her here the "undisputed queen of country" who "oozed star quality" and that the reviewer picked up on no clues of any "studio wizardry," commenting on reports from other media of lip-synching. The article also features three videos of interviews with fans outside the venue. Some Associated Press photos from Belfast are available here. The Belfast Newsletter also had good words for the night, saying she was "back in town, pert, toned and rootin' tootin' ready to rock." And the audience members agreed. Rachel tells me that in Belfast on Tuesday she "engaged so intimately with the audience"and sent in several images from the performance there here. Charlene says the performance left her "on a complete high" because it was "the most amazing concert ever." And John says the night was great, but security pushed people back into their seats when they tried to dance during "9 To 5" and ordered them to put out their lighters when they held them up for "I Will Always Love You." Cameras were banned, as has been the case with all concerts on this tour, but he managed to snap a few shots that have been posted here for your enjoyment. Even Manchester, England, is eagerly anticipating her arrival there with a preview piece here from The Manchester Evening News. After wrapping up her second Belfast show on Wednesday, she next advances to her first sold out night in Glasgow, Scotland, on Friday, then to Manchester on Saturday and back to Glasgow for a second sold-out engagement on Sunday. Pop starlet turned country singer Jessica Simpson was on The View Wednesday, chatting about her newfound friendship with Dolly and Dolly's appearance on her upcoming CD. She said she couldn't call Dolly's vocal contributions back-up singing but said they sang the song "together" instead. Sorry for the lack of a site update on Tuesday night. Your webmaster had a work conflict which prevented the usual nightly posting. I will be on vacation starting Thursday but expect to have Internet access, so hopefully the regular updates won't be interrupted further in the next few days. CMT reported here Monday that Dolly's long-lost duet with George Jones on "Rockin' Years," which she and Ricky Van Shelton took to No. 1, is the tune which will appear on Jones' collection of previously unreleased material coming out Aug. 19, Burn Your Playhouse Down. The set had originally been planned for a July release. The duet was recorded for a Jones album in 1991, but Columbia Records decided it would rather have Dolly re-record it with Van Shelton for release on her album and prevented the Jones version from coming out at the time. After being on sale to season pass holders for a week and selling out the $75 section (rows D-L) for two shows, the first day of public sales for Dolly's August benefit concerts at Dollywood saw that section sell out for the third performance as well as sell out the $35 seats (rows AA-EE) for the 2 p.m. Saturday staging. Tickets remain available at the $60 level (rows M-S) for all three and at the $35 level for 7 p.m. Saturday and 2 p.m. Sunday here,. The concerts, to be held Aug. 16-17, will raise funds for her Imagination Library literacy program. Season pass holders who bought tickets last week began receiving them in the mail Monday. The Pigeon Forge Department of Tourism confirmed Monday that the report posted here Sunday night was correct that Dolly's Homecoming Parade for next year is scheduled for May 8. Although Dollywood will open to the public at the end of March, the parade featuring Dolly won't be held until May. Dolly is drawing good marks for the Irish dates on her Backwoods Barbie World Tour. The Irish Independent on Monday praised her concert with a review here. Fans tell me her Kilkenny show was "absolutely fantastic." I understand a storm the previous night severely damaged the stage, which forced some last minute adjustments to be made to allow Dolly to perform (over objections of the venue owners, who asked her to cancel the concert). Also very high winds delayed the start by about an hour on a pretty cold evening, but the show went on. Citing the chill and the late start, Dolly opted to skip her usual intermission, and before going into "Coat of Many Colors" joked "Right now I would take a coat of ANY color!" She also encouraged any Dolly look-a-likes to throw their wigs on stage so she could burn them to stay warm. When a coat was brought out to her, she first declined and then accepted it. She also commented about the cold and wind causing her eyes and nose to run, forcing to her continually request tissues. Thanks, Sandra and Conor for sending in your notes! Dolly has the No. 1 country album in the U.K. this week, but it's not Backwoods Barbie. Her 2007 overseas compilation disc, The Very Best Of Dolly Parton Vol. 1, which was released to coincide with last year's European tour and peaked at that time at No. 8 pop and No. 1 country, is catapulted back onto the charts thanks to her current European tour. The collection lands at No. 23 pop, No. 1 country. Her current release she is touring to promote, Barbie, slides 17 to No. 52 pop and two to No. 4 country in its second week on the British tallies. No word yet on how Dolly's sold out engagement Saturday in Cork or her mostly-sold concert Sunday in Kilkenny went, but she's off next to a sold out night in Belfast on Tuesday, with seats still available for Wednesday's follow-up show in that same city. British artist Wayne Moraghan has announced that his Dolly Mixtures art exhibit, which he hosted last year for her tour, will return this year with new pieces at candy store Cybercandy in London. The works, which feature pop-art style artistic images of Dolly alongside some of her famous quotes, will be on display July 1 through Aug. 3, with special "Dolly Days" July 5 and 6 when her music will be played in the store in celebration of her London concerts those evenings. Dolly's 24th annual parade in Pigeon Forge to celebrate the season opening of Dollywood appears to be pushed back a whole month next year. According to an official calendar published by the National Park Service of events surrounding the celebration of next year's 75th anniversary of creation of the Great Smoky Mountains National Park, the parade will be held on May 8. In addition, it notes that the parade's theme will coincide with the park anniversary and that all entrants will be asked to utilize that theme in their parade entries. Originally, the parade was held the same weekend that the park opened to the public each April, but for the past few years the park has opened in late March and the parade still has been held around mid-April, leading her appearances this year to be re-styled "Dolly's Homecoming" instead of "Grand Opening." If the Park Service's listing is correct, this would mark the latest the parade has been held, coming six weeks after the park's March 28, 2009, opening for the season. Thanks, Solomon! Also, if you want airfare and opening night tickets for the premiere of Dolly's 9 To 5: The Musical in September, get your bid sent in by 10 p.m. Monday for a charity auction. Send your bids here from now through 10 p.m. Monday. The highest bidder gets the package and helps three Kentucky charities! I'm told Dolly was fabulous as usual in Thursday night's show in Rotterdam, The Netherlands. Her set list was the same as the Swedish shows, except as in Denmark she closed with "Jesus & Gravity." I'm also told that "Here You Come Again" features archival footage which makes her performance of the tune "heartbreakingly beautiful." There were also several empty seats at the front of the venue which I understand had been purchased by "ticket brokers," who offered them for re-sale at tremendously increased prices, but their asking prices were too high to get many buyers, and they refused to reduce the ridiculous prices as the show neared, so they remained unsold. The Dutch newspapers covered the concert here, here and here. I'm told that two of the articles include commentary on her use of some pre-recorded vocals during the show, but the third praised the show. Catherine sent in some photos from the concert which have been posted here (such as the one at left), and images from Eric are available here. Thanks Catherine, Eric and Judy! And Ireland is anticipating her arrival there. The Belfast Telegraph fetes her accomplishments in a profile available here in advance of her sold out Cork show Saturday, Kilkenny engagement Sunday and back-to-back Belfast dates Tuesday and Wednesday. In addition, her July 1 Nottingham, England, concert is the latest to sell out, Ticketmaster indicates. "Jesus & Gravity" stays put at No. 2 for another week on the Pure 12 Pack Countdown on CMT's Pure Country digital cable channel, its eighth week on the tally. Vote for it in the regular CMT countdown here and 12 Pack here. There's no turnaround yet as Dolly's Backwoods Barbie continues its descent on the Billboard country albums charts in the June 28 numbers released Thursday. The CD drops another two spots in its 17th week to come in at No. 49, while the compilation collection 16 Biggest Hits loses five to No. 45 in its 36th chart week. The magazine also has another Dolly concert on its Box Score returns, showing her May 3 Atlantic City engagement was 91 percent sold out and grossed $159,720. As was reported here Wednesday night, pal Emmylou Harris debuts at No. 22 pop with All I Intended To Be, which features a Dolly appearance on "Gold," and as was predicted here, the set lands at No. 4 country albums. It also comes in at No. 2 country, No. 24 pop in Canada. Brad Paisley's Time Well Wasted, with Dolly on "When I Get Where I'm Going," inches up two to No. 15 on the country catalog albums list, and the collection God Bless the USA, featuring Dolly's "Color Me America," jumps up 17 places to No. 44 country in its seventh week. The self-titled debut CD from Taylor Swift gains one to No. 1 country and falls one to No. 16 pop in its 86th week, while Toby Keith's 35 Biggest Hits rises one to No. 2 country and remains steady at No. 18 pop in its sixth chart week. As Dolly prepares to head to the British Isles for the next segment of her European tour, she's getting coverage. The Mirror in London gives kudos for her CD, Backwoods Barbie, which it calls "Wonderful" here. And Ireland's Kilkenny Advertiser plugs her upcoming show there with a positive article here and a less-positive note (including recapping a several-years-old Dolly quote to Dollymania) here. With about 100 Rotary Clubs nationwide sponsoring chapters of Dolly's Imagination Library literacy program, she was a featured speaker this week at the Rotary International convention in Los Angeles. Although she couldn't be there in person due to the tour, she sent a video message to talk about the program. Read notes about it here and here from Rotary.org. In related news, thanks to Greg for pointing out that Dollywood.com is reporting that the front section of the theatre has sold out for two of Dolly's three benefit concerts for the program which will be held at the park in August. The charity auction for airfare and tickets to the premiere night performance in Los Angeles of Dolly's 9 To 5: The Musical in September ended Thursday without reaching the minimum reserve bid. Bidding topped out at $1,127. Organizers inform Dollymania that they will accept "blind bids" on the package via e-mail here from now through 10 p.m. Monday. Whoever sends in the highest bid amount during that time period will win the auction. Thanks! Rebecca Lynn Howard talks about her love for Dolly's songwriting and what it was like to work with her in 2001 in an interview with Country Stars Central here. An anti-government-incentives organization has filed a lawsuit against Dolly's brother Randy and several other individuals associated with his failed theatre in Roanoke Rapids, N.C., accusing them of fraudulently obtaining and using taxpayer dollars for the project. The Triangle Business Journal reports here that the organization, the North Carolina Institute for Constitutional Law, has a habit of suing companies that get financial incentives from governmental bodies for their work. 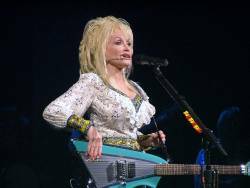 In news that is certain to make some Canadian fans happy and make others worried they may not get to see her in a while, Dolly said in a brief interview which aired Wednesday on FOX News that it is possible that some Canadian dates will be added to her Backwoods Barbie World Tour, although she was uncertain whether or not that was going to be possible. The tour has already had one American leg and is presently on its European leg. In the satellite interview, available online here, she noted that after the European portion she will return to the U.S. to finish out the year with additional concerts here and, "hopefully," in Canada. "We may get a chance to do some shows there," she added about our neighbors to the north. When the tour was first announced, she said she planned to tour the U.S., Europe, Canada and possibly Australia, although no Canadian or Australian dates have been announced and this marks her first comment in about nine months that Canada may be on the itinerary. No word has come since those early remarks about any dates being likely Down Under, though. Thanks to Hans for e-mailing me the link to a wonderful Norwegian national television special profiling Dolly and her long career. Interspersed among new interview clips with her for the program are pieces of great vintage footage from over the years. Watch the more than half-an-hour-long program online here. The network also has a shortened version, cut to six minutes with a little behind-the-scenes footage and some different clips of archival footage between the edited interview portions, available from a different episode here as well. No word yet on what Dolly's records are doing on the new Billboard charts to come out on Thursday, but the magazine revealed Wednesday that pal Emmylou Harris will see her new CD, All I Intended To Be, debut at No. 22 on the pop charts with 27,000 units sold in its first week. It should be somewhere around No. 4 on the country albums tally. The collection features Dolly guest vocals on the track "Gold." Dolly's music website, DollyPartonMusic.net, on Wednesday added a "sale" page to its online store to offer clearance merchandise. The first item is two versions of a shirt that had not previously been offered on the site. It features the photo of her standing in front of the truck from the current CD's inside artwork discounted to about 75 percent off. Local media are starting to cover the expansion of Dolly's Imagination Library literacy program into the Quad Cities region of Iowa. Check out a story from The River Cities Reader here. 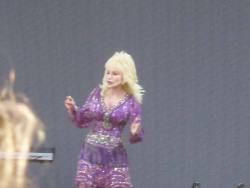 Special thanks to Jenny for sending in some photos from Dolly's recent Malm� concert in Sweden. They have been posted in a gallery here. She tells me the audience gave several standing ovations, and they responded so well to the a capella version of "Do I Ever Cross Your Mind" that she did an extended version of it and had her female backup singers join in for the usually-male-backup-only number. Supposedly, the entire Swedish royal family are big fans, and the youngest princess was in the audience (she's on the right side of a photo in the review from Aftonbladet here.) Jenny also corrected me that "White Limozeen" was performed in the concert, contrary to a note posted here based on another attendee's set list from the show. Great American Country on Tuesday posted another story taken from Jessica Simpson's recent interview on its national radio program, this time offering her explanation of why she flubbed "9 To 5" at the Kennedy Center Honors tribute to Dolly and how gracious and supportive Dolly was after it. Read the article here. Dolly couldn't be there due to the European tour, but her music was. Inducted into the first class of the Blue Ridge Music Hall of Fame Friday in the songwriter category, her "Jolene" was performed by Laurelyn Dosset as part of the Hall's ceremony in North Carolina, The Wilkes Journal Patriot reports here. Check out a group of Dolly fans outside of a London show as part of a photographer's new collection of music fan portraits, contrasted by New York Magazine with the fans of Marilyn Manson here. 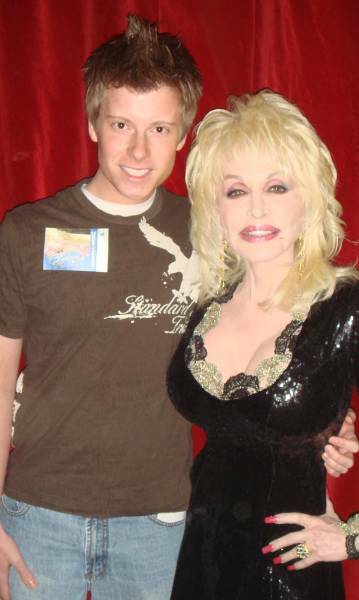 The Wheeling News-Register sent a travel reporter to Dollywood recently, returning with the message to go forth and enjoy some of Dolly's hospitality! Read about it here. The Northwestern in Oshkosh, Wis., continues its coverage this week of the launch of Dolly's Imagination Library literacy program with notes about the first books' arrival in local children's mailboxes. Check it out here. With no advance warning, other than the report on Dollymania a few days ago from a source who stated that a sale date for tickets would be announced "sometime" this week, Dollywood on Monday morning began selling tickets for Dolly's three concerts at the theme park Aug. 16 and 17 as part of her Backwoods Barbie World Tour. Seats became available for season passholders at 10 a.m. Eastern time Monday via the park's website here, with an announcement e-mailed to passholders nearly an hour later to inform them that tickets were on sale. A few minutes later, a press release was issued in which Dolly said: "This 'backwoods Barbie' has literally been around the world on this tour, but there's nothing like coming home to my friends and family at Dollywood. Even though I'll be home, they're putting me to work, but it warms my heart to know these shows will benefit something that's so very near and dear to me, my Imagination Library." Each passholder is limited to a total of six tickets for the three shows, which are scheduled for 2 p.m. and 7 p.m. Aug. 16 and 2 p.m. Aug. 17. Prices are $75, $60 and $35. As they benefit her Imagination Library literacy program, $30 of each ticket is tax deductible as a charitable contribution. Those who don't have a season pass will be able to purchase tickets online starting 10 a.m. next Monday, June 23, when they become available to the public if the shows do not sell out to season passholders. Seating requests will be filled in the order they are received, and purchasers should have their tickets and seating assignments in hand in about 10 days. Dolly seems to be mixing things up a bit overseas, I'm told. On the third engagement of the European leg of the Backwoods Barbie World Tour, Sunday night in Viborg, Denmark, she switched out "Hello God," the finale for her first two concerts on the continent, for current single "Jesus & Gravity," which closed the shows on the first American leg of the tour earlier this year. Also, I'm told she did "White Limozeen" in Stockholm on the tour opener Friday, although it apparently wasn't included Saturday in Malm�, which otherwise featured the same set list. In Denmark, she also skipped her usual 20-minute intermission due to some threatening rain clouds at the outdoor venue, although showers held off until her encore. Special thanks to Noelle for sending in some shots from Friday night's show in Stockholm, such as the one at left, which have been posted in galleries here and here! Claus tells me that the local paper in Denmark, Jyllandsposten, loved the show, calling her here a "musical whirlwind" and saying the focus was on her "marvelous" new CD (which the same reviewer recently praised in the newspaper here). A positive review from Malm� was sent in from Anna-Karin here in Sweden's Sydsvenskan, although a note here reported that several fans requested refunds over apparent malfunctions in the sound system. Dolly next plays Kristiandsand, Norway, on Tuesday night, followed by Rotterdam, The Netherlands, on Thursday. Then she wraps up this part of the tour with a dozen dates across Ireland, Northern Ireland, Scotland, England and Wales. Thanks, all! Dolly got a mention in a piece from Britain's Times in which the writer wondered why women are not thought of as intelligent. It was noted that Dolly was ranked at No. 94 in a British poll of the world's top 100 living geniuses. Read it here. She also earned some digital ink from CMT.com weekly columnist Hazel Smith, whose "Hot Dish" item this week included a note about the latest crop of female singers who can't hold a candle to the grande dames of the genre: Patsy, Loretta, Tammy and Dolly. "Nobody had that high pristine country, bluegrass and pop tremor like Dolly Parton," Smith wrote. "You'd recognize the vocals of either of those four women even if you were awakened from a deep sleep while having a bad dream in Russia." Read this week's full column here. Dolly's official music website, DollyPartonMusic.net, has added a couple of new items to its online store: a tank top shirt of the Dolly mudflap design and the new tour book for the Backwoods Barbie World Tour. �Emmylou Harris' new CD, All I Intended To Be, with its Dolly collaboration on "Gold," continues to garner attention, this time from Canada's Globe and Mail, which has an interview with the singer posted here. Don't forget that the eBay charity auction by St. Mark Catholic Church of Richmond, Ky., for Sept. 3 opening night tickets and airfare to Dolly's 9 To 5: The Musical premiere in L.A. ends Thursday night. As of press time Monday night, bidding had reached $1,127. See the auction here. First-week sales for the British release of Dolly's current CD, Backwoods Barbie, issued there via Universal, were pushed up enough by publicity for the 2008-2009 Backwoods Barbie World Tour that the CD debuts in Monday's UK pop albums chart at No. 35. The collection is the second-highest ranked country CD, meaning it would be No. 2 on the country chart behind a Willie Nelson compilation. Her last studio album, 2005's Those Were The Days, also went to No. 35 pop and No. 2 country on the British tally. Her most recent U.K. stop on the charts was the compilation collection The Very Best Of Dolly Parton, Vol. 1, which last year's European tour pushed to No. 1 country, No. 8 pop to become her first-ever top 10 pop album in England. The World of Wonder Storefront Gallery in Hollywood, Calif. is planning a Dolly exhibit this fall and is seeking submissions. They asked if I'd pass along that if you want to see your original Dolly artwork or photos of yourself with her on display at the Hollywood Boulevard location starting Sept. 12, get in touch with them! Images of art "inspired by Dolly" and photos of Dolly with fans to be considered for display in the show should be e-mailed to iheartdollyparton@yahoo.com. Although there's no report in yet from Friday night's Stockholm opener for the European leg of Dolly's 2008-2009 Backwoods Barbie World Tour, thanks to Anna-Karin for alerting me to an announcement that the second night of the tour, Saturday in Malm�, Sweden, will be pushed back a little. Turns out the Swedish soccer team is in the European championship and will play a game from 6 p.m. until 8 p.m., so to accommodate them, her concert will be delayed 30 minutes, according to Aftonbladet here. She also sent along a story from Noje about her tour bus here titled "This is where Dolly is hiding in Sweden." And Britain's The Mirror had a little interview available here as well. Although Dolly couldn't be there because of the tour, the Associated Press picked up the story Friday on that evening's induction ceremony for the first class of the Blue Ridge Music Hall of Fame, which includes Dolly. Read about it here. The tour is also keeping her away from KidsFest at Dollywood for the first time since the event started five years ago, but the festivities continued without her as the three-week event kicked off Friday with this year's headliners, animal trainers the Kratt Brothers. Check out a story from The Knoxville News-Sentinel here and a press release here. Dolly's video for "Jesus & Gravity" holds on again on CMT's digital cable channel, Pure Country, inching back up one to No. 2 this week, its seventh on its Pure 12 Pack countdown. Vote for it in the regular CMT countdown here and 12 Pack here. It's previously been reported that Dolly had written and recorded vocals for a song on Jessica Simpson's upcoming CD, but GAC on Friday passed along news from an interview with Simpson on its GAC Nights radio program revealing the name of the track ("Do You Know") and the story of how Dolly got it to her. Read it here. Thanks to Adam for alerting me to a Yahoo Music blog entry that listed Dolly as No. 18 on one critic's list of the 25 greatest musical legends of all time. Look at his list here. The June 21 Billboard charts didn't bring good news for Dolly and her current CD, Backwoods Barbie. The collection slides another four places to No. 47 in its 16th week on the country albums tally, while the compilation 16 Biggest Hits gains another digit to No. 40 in its 35th chart week. Brad Paisley's Time Well Wasted, featuring Dolly on "When I Get Where I'm Going," dips one to No. 17 on the country catalog albums list, and the various artist collection God Bless the USA, with Dolly's "Color Me America," rebounds one to No. 61 country in its sixth week. Folk singer Jewel lands the No. 1 country, No. 8 pop debut with 48,000 copies sold of her first-ever country album, Perfectly Clear, which causes the self-titled debut CD from Taylor Swift to drop one to No. 2 country and three to No. 15 pop in its 85th week. Look Out, Europe, Here She Comes! Coverage continued Thursday of the European leg of Dolly's 2008-2009 Backwoods Barbie World Tour in advance of its Stockholm opener Friday night. Thanks to Anna-Karin for alerting me to the story "Waiting For Dolly" which will appear in Friday's edition of Sweden's largest morning newspaper, Dagens Nyheter, available online here. The promoter for her Irish shows blasted the media for recent reports of slow concert sales, noting that her Kilkenny concert has 18,000 out of the 22,000 seats sold and that tickets are expected to continue moving in the week and a half leading up to the event. He added that she's also sold 5,000 seats in Cork and 12,500 in Belfast. Read that story here from Hot Press and the original story from Wednesday's Herald here, which claimed she was "struggling to fill" the venue. The Kilkenny show also got press, positive this time, from The Kilkenny People here. And British LGBT publication Rainbow Network reviewed the CD, released overseas on Monday, here. Thanks to Jonathan and Nick for letting me know that Emmylou Harris has released a video discussing how she came to get Dolly on the track "Gold" for her new CD, All I Intended To Be. The video is available on Harris' official website here (go to "Media" and check out "Video 4") and on YouTube here. Dolly's Imagination Library literacy program is expanding into Ocala and Reddick, Fla., according to The Ocala Star Banner here, and thanks to David for alerting me to its partnership with United Way of the Quad Cities in Iowa here. Now on her way to kick off the European leg of her world tour in Sweden, Dolly spoke in Atlantic City a few weeks back with Swedish newspaper Fredag, which posted its interview and photo here on Tuesday (if you can read Swedish). Thanks, Anna! And speaking of the tour, while Dollywood has yet to release an official announcement of her Aug. 16-17 concerts there, I understand there will be three shows and that tickets will go on sale sometime next week exclusively for the park's season passholders and only online. More details once an official announcement comes out. Having made its way to stores on Tuesday, Emmylou Harris' All I Intended To Be continues to get good marks from critics. The Boston Globe here singles out her collaboration with Dolly and Vince Gill, "Gold," as the album's "essential" cut, noting: "If there's a more heavenly choir than Dolly Parton and Vince Gill, it has yet to be discovered. The pair offers shiver-inducing back-up to the album's delicate, melancholic peak, 'Gold,' written by Harris." And The Vancouver Sun agrees here that "the highlights are the harmonies between her, Parton and Vince Gill on 'Gold'." Want a trip to LA to see the world premiere of Dolly's 9 To 5: The Musical? St. Mark Catholic Church of Richmond, Ky., is offering a vacation package on eBay to raise funds for the church, breast cancer awareness and a local home for mentally challenged women. The winner gets two tickets to the Sept. 3 world premiere performance and airfare from any location within the U.S. Check out the auction here. The auction ends just before 9 p.m. Eastern time June 19. Pilot programs in Canada for Dolly's Imagination Library literacy project are looking to find funds to continue the work of bringing free books to the communities' children now that funding for the first year of operation has ended in Newfoundland, according to reports from The Georgian here and The Western Star here. With the heat of summer upon us, many of you are likely thinking of taking a dip at Dollywood's Splash Country water park. The park's been open for a few weeks now, and the young ones would probably enjoy it during the opening of KidsFest at Dollywood this weekend. Thanks to Dollymania contributing photographer Jason Worley for sending in some shots of what the park looks like this year with its new Swift Water Run addition, which is located where the former Rain Tree Hollow attraction used to stand. Take a look at his images here! Dolly's official music website, DollyPartonMusic.net, on Monday revealed Dolly-ite pre-sales for three of her recently-added fall concerts on the 2008-2009 Backwoods Barbie World Tour. Seats will go on pre-sale at 10 a.m. local time Wednesday for three of the five dates first reported here Wednesday night: Aug. 10 in Denver, Aug. 11 in Omaha and Aug. 14 in St. Louis. The site also reported a change in venue for her Denver show, which her publicist had originally listed as taking place in the Ellie Caulkins Opera House, a venue in the Denver Performing Arts Complex. The show will now be held in the Wells Fargo Theatre of the Colorado Convention Center. Public ticket sales will begin at 10 a.m. local time Saturday for Omaha and St. Louis, while Denver's public sales start at 10 am. local time Monday. St. Louis is the only show not being sold through Ticketmaster, as seats will only be available through the venue's website. The Omaha World Herald on Monday evening noted her concert in their city here, while The St. Louis Post-Dispatch reported on the concert there on Monday here. And although many rumors abound about when tickets for her Aug. 16 and 17 Dollywood concerts, also reported here Wednesday, will go on sale, that information has yet to be officially announced yet. In other updates, DollyPartonMusic.net on Monday added more items to its store, including several t-shirts ("Aunt Dolly" shirts, shirts listing all 25 of her No. 1 hits, shirts featuring the mudflap design from the new CD, etc. ), more caps, a CD cover art keychain, coffee mugs and more. In addition, the site added new live video from her recent Atlanta concert and the video showing the interior of her new tour bus, which was just finished a few days ago, apparently. It was confirmed and reported several months ago that Dolly had cut vocals for a track on pop queen Jessica Simpson's upcoming country album, but it wasn't publicly known until over the weekend that the song is one that Dolly herself wrote. The Tennessean broke that news Sunday with a piece here on the yet-to-be-titled collection, which aims to be in stores on Sept. 9 from Columbia Nashville. The single may have died at radio and the video never caught on at CMT or GAC, but "Jesus & Gravity" continues to make a mark on CMT's digital cable alternative, Pure Country, thanks to viewer votes online. The song slipped one last week to No. 3 on the Pure 12 Pack countdown in its sixth week on Pure Country's chart. Vote for it in the regular CMT countdown here and 12 Pack here. In related news, I'm told her CMT Insider interview over the weekend was filmed during her Dollywood homecoming weekend in April and that she discussed her tour (and its delay), the CD and more. The show repeats on Monday. The first date on the European leg of Dolly's 2008-2009 Backwoods Barbie World Tour is less than a week away, so she's probably getting busy to head overseas to get things in place to sing. In advance of the trek, what is being billed as her only British newspaper interview prior to the tour hit newsstands over the weekend from The People. Read it online here. I'm also told that Friday's Nottingham Evening Post gave her new CD four-out-of-five stars in a review. Thanks, Cheryl! With All I Intended To Be from pal Emmylou Harris making its way to stores on Tuesday, the reviews of the collection are starting. Entertainment Weekly over the weekend gave it an "A-," stating that her track with Dolly, "Gold," highlights her songwriting gifts. "On this superb, epically desolate weeper, her vocals meld with the more twanging tones of guest Dolly Parton to 23-karat effect," the magazine opines here. And The Irish Independent here says the album returns her to "elegantly chiming country-rock" after her recent period of "artsy false perspectives." Texas Democrats remembered two giants of their political scene over the weekend, using Dolly in one instance to help. Her song "Wildflowers" was played during an homage to former First Lady Ladybird Johnson, who encouraged the planting of native wildflowers seen today along most of the interstate highways throughout the United States. The other lady honored was former Gov. Ann Richards, a friend of Dolly's. Both women passed away in the past year. Read more here. I was asked to pass along a plea I received from GCAP Media in the U.K. They're putting together a Dolly tribute entry for the Brighton gay pride event featuring 21 "Dollys" performing a dance routine. So they're looking for "good quality dance remixes" of Dolly tracks as well as classic Dolly audio clips of her famous one-liners. Anyone who can help is asked to e-mail dionmills@hotmail.com. With the European version of Dolly's Backwoods Barbie CD hitting shelves on Monday, the press is beginning to take notice. Two papers on Friday gave the collection four-out-of-five stars. The Manchester Evening News said here that Dolly aimed for a "big blockbuster of a pop-country album" but managed to avoid creating "some high-gloss confection." It calls her cover of "Drives Me Crazy" "brilliant" and "Tracks Of My Tears" "memorable." Nearby, The Irish Independent here lauds "its combination of technical accomplishment and sheer likeability," singling out her songwriting and knack for finding the right songs to cover. I'm told a positive review also aired on the BBC's Newsnight Review, but the online version here is only viewable in the U.K. Thanks, Cathy! And a note on its release made the BBC2 here. Saturday's third annual Whoadeo fest at Dolly's Branson Dixie Stampede got some more publicity Friday with a story from TV station KOLR. Watch it here. With its continual fall on the charts, Dolly's new studio CD this week drops below her most recent successful compilation of old hits in the June 14 Billboard numbers. Backwoods Barbie tumbles seven more spots in its 15th week on the country albums charts to fall to No. 43, which is two spots lower than her collection 16 Biggest Hits, which rises one to No. 41 country in its 34th week. American Idol winner David Cook also sees his Dolly tracks fall off of all of the charts. The previous week, his cover of her "Little Sparrow" showed up at No. 66 for digital downloads, No. 1 on the Bubbling Under The Hot 100 list (essentially meaning No. 101 for the all-genre song chart), No. 79 on the pop 100, No. 74 Canadian digital singles sales and No. 96 on the Canadian Hot 100. Brad Paisley's Time Well Wasted, with the Dolly duet "When I Get Where I'm Going," remains steady at No. 16 on the country catalog albums list, while the compilation, God Bless the USA, featuring her "Color Me America," loses two to No. 62 country in its fifth week. The self-titled debut CD from Taylor Swift regains one to No. 1 country and remains steady at No. 12 pop in its 84th week, and Toby Keith's 35 Biggest Hits gains one to No. 2 country and loses one to No. 14 pop in its fourth week. When Chris met Dolly at her Atlanta concert in April, he says it was the highlight of his year, even though he was graduated from nursing school three days later. He was so "glassy-eyed and awestruck" to meet her that all he could do was comment on her hair, after she said his haircut was cute. Check out his photo with her here. Thanks! In other concert news, The San Jose Mercury News is looking forward to her arrival in Berkley, noting the show with the comment that she and Merle Haggard are tied for "the greatest living country singer-songwriter." Read the item here. Mike Myers gives his take on Dolly's classic "9 To 5" on the soundtrack to his new film, The Love Guru. The song is available early exclusively through iTunes when you purchase the entire album here and is available on the CD version here when it comes out June 17. Wired doesn't care for the collection, though. It also includes his versions of "The Joker" and "More Than Words." See a review here. When television interviewer Gavin Esler was appearing on British talk show Loose Women to promote his new book, they wanted a clip of him interviewing "someone interesting," so whom did he choose? Dolly, of course! He said here that he chose her because she "is as sharp politically as anyone I have ever met (and that includes Mrs. Thatcher and Bill and Hillary Clinton)." Thrill ride enthusiasts are expected in droves this weekend at Dollywood for the first-ever Thrills in the Hills event Friday through Sunday. Visitors who signed up for the special treatment will get exclusive rides on the park's four roller coasters (Mystery Mine, Thunderhead, Tennessee Tornado and Blazing Fury) and special behind-the-scenes tours of each. Country star Marty Stuart is presently exhibiting several of his photographs of fellow artists, including one of Dolly, in the C Concourse of the Nashville International Airport, The Tennessean reports here. Check out Dolly's image from the show here. Dollywood has responded to the recent tabloid reports that actress Lindsay Lohan plans to marry her supposed girlfriend at the park. "No one has contacted either Dollywood or Dolly directly regarding the story you mention," spokesperson Pete Owens tells The Knoxville Metro Pulse this week here. "Dollywood does not offer public wedding facilities nor does it have a facility for weddings. I wish her the best." The ladies of Mayo, Ireland, want Dolly's bra. Well, at least it's for a good cause! According to local newspaper Western People here, the Rock Rose Chicks, a group of women who have faced cancer, want her to donate a brassiere for their attempt to break the record for the world's longest bra chain� 200,000 in all � to call attention to cancer. A mishap with a screen on the Hannah Montana movie set, and Dolly's appearance in the film (which, as was previously reported here, was scheduled for filming in a concert segment near Nashville this week) got mentions from E! Online's news coverage here. The Branson, Mo., location of Dolly's Dixie Stampede dinner theatre chain will present its third annual free Whoadeo stick horse rodeo this Saturday, with all proceeds from the day's show performance being donated to support her Imagination Library literacy program. Learn more from Springfield TV station KSPR here. In related news, the program's expansion into Escambia County, Fla., makes The Pensacola News Journal here this week. Dolly just played a sold out show at Atlanta's Fox Theater one month ago, and she's already scheduled her second engagement in the city on the same tour. Her official music website, DollyPartonMusic.net, on Monday revealed she will play the city's Chastain Park on Oct. 24 as part of her 2008-2009 Backwoods Barbie World Tour. Tickets will go on pre-sale for Dolly-ite online fan community members at 10 a.m. local time Wednesday, ending at 10 p.m. Friday prior to the public sale on Saturday. The website also announced, as was predicted here, that Dolly-ite pre-sales for her Aug. 13 Detroit-area concert will be available during the same two-and-a-half-day period prior to their regular sales on Saturday. In related news, the website on Sunday added a handful of tour merchandize to its store � nearly two months after it was originally expected to do so. Thanks, Jason! Now being offered are a charm braclet with the Dolly signature logo on a butterfly, a black cap featuring the new stylized Dolly name from the website's masthead, a women's jacket with the same logo, a t-shirt with the name "Dolly" written across a tattoo-style heart and a tour t-shirt with the standard Dolly signature logo and the cover shot from the new CD. And finally, the website on Monday announced Vallory Jones of Austin as the first winner to be placed in Dolly's Top Eight on her official MySpace page here. Entries are being taken now on the site for the next round of winners, to be announced July 14. Don't forget if you're on the West Coast, or planning to travel to Los Angeles for the Sept. 3-Oct. 19 test run of Dolly's new 9 To 5: The Musical show prior to its 2009 move to Broadway, individual tickets to the show go on sale to the public Tuesday here following a period of pre-sales to season ticketholders. Dolly gets another interview this weekend with Katie Cook on CMT's weekly Insider news series, the cable network revealed Monday. No word on what the interview covers or when it was filmed. The episode premieres at 1 p.m. Saturday with repeats on Sunday and Monday. Orange County, Ind., is the latest community to sign up for Dolly's international literacy program, the Imagination Library. According to The Times-Mail in Bedford, the project is being supported by the county commissioners and being operated by Hoosier Uplands. Read more here. Dolly's project, which sends out more than 5 million free books a year, provides one age-appropriate, hardcover book every month from birth to age 5 to every child in a participating community whose parents sign up.